Cohabitation marriage, or common law marriage, occurs when a couple lives together and acts as husband and wife, despite no formal ceremony. Only a few states recognize this type of marriage. Consequently, many couples may not receive an equitable division of the couple's property, spousal support, or any other protection afforded traditionally married couples if the relationship ends. Contrary to popular belief, common law marriage is not legal across the United States. Less than half the states recognize common law marriage, and half of those states recognize them in limited circumstances. It is important to check state law to determine whether your state recognizes common law marriage and whether your relationship meets the state's requirements. If it does not, you may find yourself with few to no rights to shared property if the relationship ends. Eight additional states recognize common law marriage under specific circumstances. New Hampshire recognizes common law marriage if the couple lived together for three years, but the marriage is valid only when one partner dies. This means if you and your partner live together for five years and then break up, you cannot file for divorce nor ask for your assets to be divided because New Hampshire does not consider the relationship to be a valid marriage. If, however, you lived together for five years and your partner dies, the state will consider the relationship to be a valid marriage (provided it met the other requirements) for purposes of inheritance. This means you will have certain rights to his property as the surviving spouse. Alabama, Florida, Georgia, Idaho, Indiana, Ohio and Pennsylvania have all abolished common law marriage but will continue to recognize marriages created before they were outlawed. In addition, any state that prohibits common law marriage will honor a valid common law marriage from another state. For example, common law marriage does not exist in California. However, if a South Carolina couple who met the requirements of common law marriage in their home state relocates to California, California would honor the marriage, even though common law marriage is otherwise invalid. Common law marriages may not begin with the formality of a traditional marriage, but they still end in divorce court if the couple splits up. If, however, the couple lived in a state that does not recognize common law marriage, or if the court finds the relationship does not satisfy the requirements of a common law marriage, the court has no authority to deal with property issues. A couple with a valid common law marriage must file for divorce, just like any traditionally married couple. The same divorce laws apply; there are no special laws that govern the dissolution of a common law marriage. If the parties cannot agree on property division, spousal support, child custody and child support, the court will make the decision. The only potential difference in the divorce proceedings of a common law marriage is if one party denies the existence of the marriage. If this happens, the party who filed for divorce must prove the relationship meets the state's requirements for common law marriage. Plenty of couples live together, even combining incomes, sharing expenses, and purchasing property together, but do not consider themselves married. That is why when a court is trying to determine the validity of a common law marriage, it will look to the parties' actions and intent. Couples must prove they are of legal marriage age, have lived together as husband and wife, and hold themselves out to the public as a married couple. Some states allow couples to formally declare their common law marriage. Utah requires couples who believe they are common law married to petition the court for recognition of the relationship, while in Texas such a declaration is optional. One common, but false, belief is a couple is common law married if they have lived together for seven years. The truth is, with the exception of New Hampshire's three-year requirement, there is no minimum cohabitation requirement; instead, the courts focus on the parties' intent. If the couple's intent in living together was to do so as husband and wife and present themselves as such even for only a day, that would be sufficient to prove the existence of the marriage. If the couple entered into a cohabitation agreement, which is similar to a premarital agreement and describes each partner's rights and obligations regarding property they used jointly and/or accumulated throughout the relationship, that agreement would govern the division of assets. You can sign a cohabitation agreement before moving in together, or any time after that. If no such agreement exists, the parties would have to file suit in court seeking a portion of the assets under theories of contract law, such as unjust enrichment (not awarding one partner a share of the assets would unjustly enrich the other, for example, one partner contributed half the monthly mortgage payment despite his name not being on home's title) or quantum meruit (where one partner is entitled to compensation for the services provided to the relationship, i.e., maintaining the home and raising the children while the other partner worked), which are difficult to prove. If you and your partner have been living together under the assumption you are common law married, it is important to make sure you live in one of the states that recognizes these marriages. 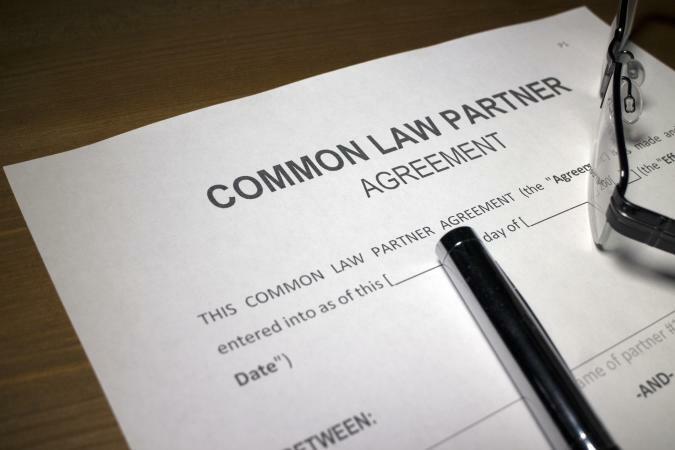 If you do not, or if your relationship does not meet the requirements of a common law marriage, you should meet with an attorney regarding a cohabitation agreement. If you don't, and the relationship ends and you and your partner cannot agree on property division, you may find yourself with limited legal options to obtain a fair share of the property.